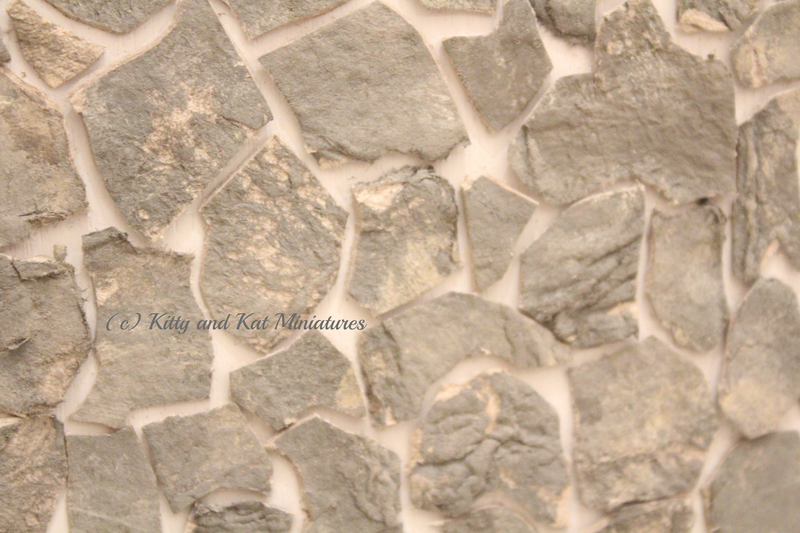 Let's just say that this post has been in the works so long that I forgot I had a draft sitting around....the half scale projects stole my time away...so now I have the time to write about stones (and found time to edit pictures). The room box is long since done, but I will catch up telling you about it! Did I mentioned it started snowing last week? Did I mention I now really, really regret not taking pictures of the finished room box is the sun and heat of the Christmas weekend. I really, really regret being lazy. Sigh. It's been a loooooooooooong process making egg carton stones. First, I realized that Miniland.ca has revamped their site and their brilliant egg carton stone tutorial is no longer there. Think of all those dead links on Pinterest....... Oh well, I thought, I can wing this, right? 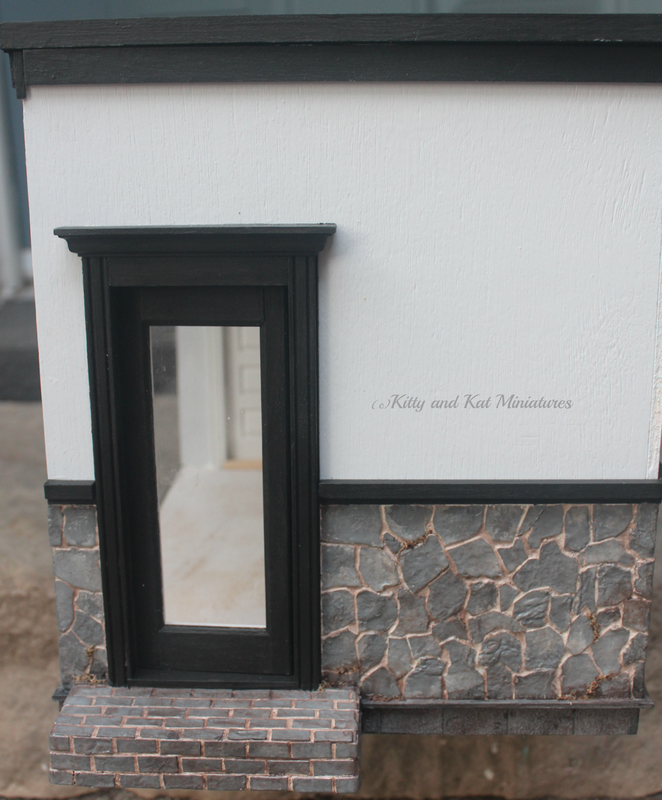 I had made the stone fireplace so I made the assumption I could make a few stone walls. So. Many. Stones. Then I thought, well, why not brick the steps for something different. So. Many. Bricks. Then, lets make some cinder blocks for a foundation. Not. So. Many. Blocks. But, enough to make me no longer want to look at eggs and sand paper for a while. I tinkered with this post for a bit and decided to make it a tutorial in case you have the (mis)fortune of landing on it when you were looking up how to make stone. Before we start, I both glued (with construction adhesive) and screwed a wood block to the front of the room box to act as the front step. It's actually attached to the wood base I adhered the room box too. I separated the 2 halves of the egg carton. I didn't flatten out either side because when you cut up the stones, I like the weird raised bumps and lumps. I do press them down a bit, but they really add to your stones appearance. Paint! I used a plastic pallet and loaded it up with all my paint colours. Using my sponge, I started with the darkest colour and sponged thin layers on to my already grey (my cartons are grey generally) cartons and then repeated the process with each colour working towards the lightest shade. 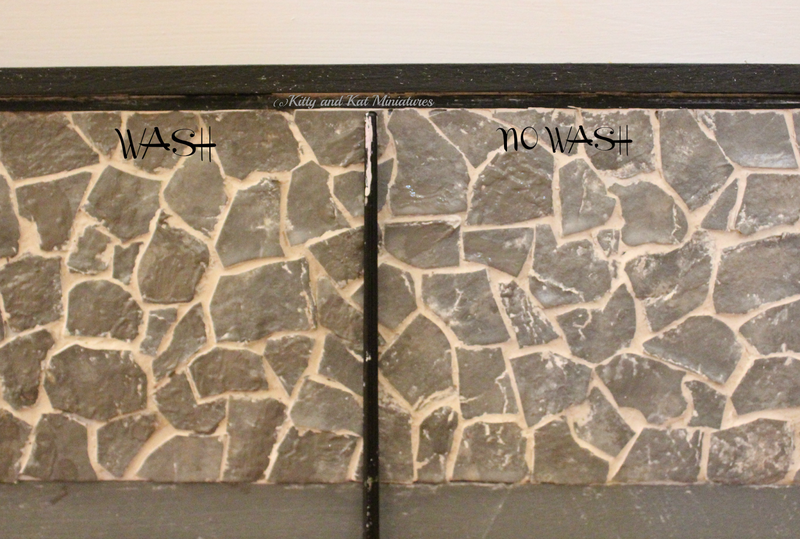 Vary your dabbing pressure and make sure that some areas are darker, others lighter...like natural stone. Let it dry thoroughly. Some people rip up their egg cartons. I prefer using my scissors and make random cuts. All shapes and sizes. 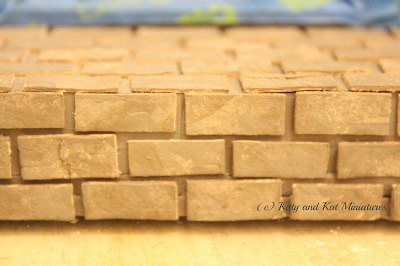 Cutting gives a neater edge, especially when grouting. Glue it down! It's a miserable jig saw puzzle that might take a few nights since I couldn't look at it for too long even with wine. Cut and fit....find interlocking pieces...ensure the colour varies...gah! 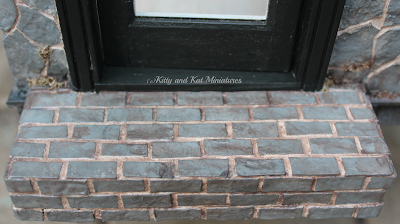 Before I move to grouting, I was concerned that the grout was going to sink into the egg carton, so I taped off all my wood (and cover ALL you plastic on windows and doors - unlike me) and then sprayed the stone/bricks with a clear matte finish spray paint. 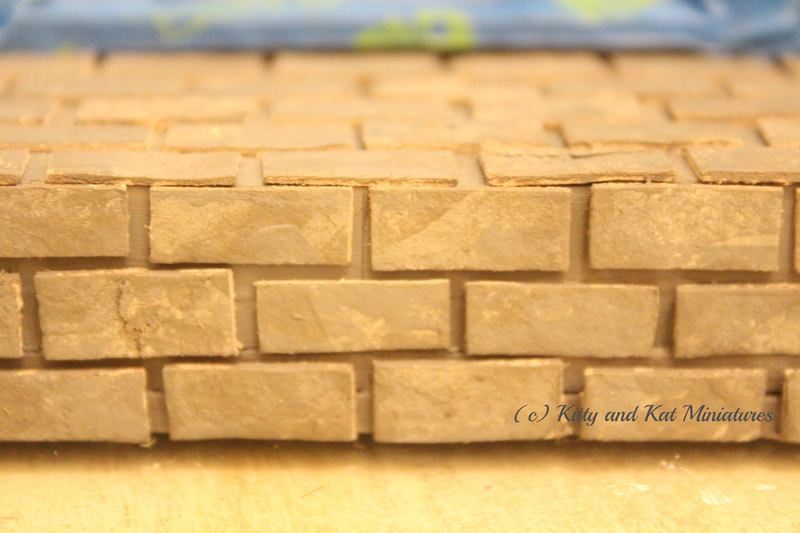 I made grout from regular hardware store wall plaster. I made it a bit thicker then usual to ensure it wasn't a drippy mess and smeared it with my fingers into the grout lines. I worked in 10cmx10cm areas so I could go back and wipe each stone off (2-3 times) with a damp cloth and remove excess grout. 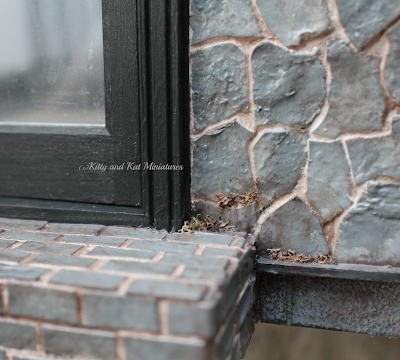 This is where the clear matte spray pays off - the water absorbs less into the stone. I love how the grout got into stone crevasses and left some there for effect. 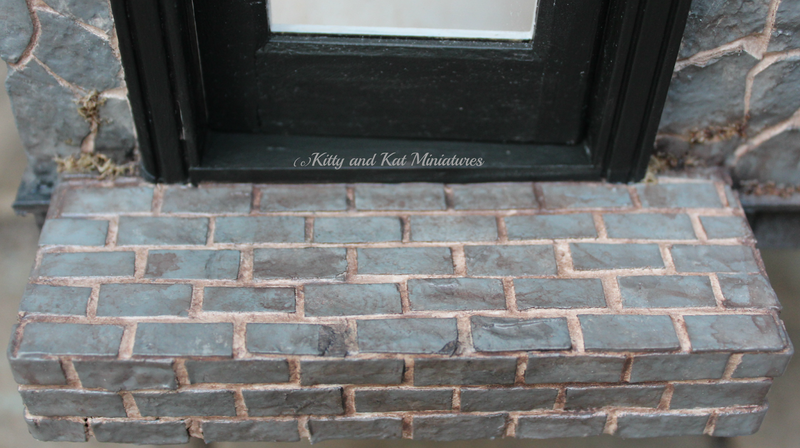 To make the grout less glaring white, I used a brown wash (Martha Stewart Vanilla Bean) over the stones, bricks and grout. Applied with a paint brush then blotted off. I also went back and touched up stone colouring with my sponge and paints. 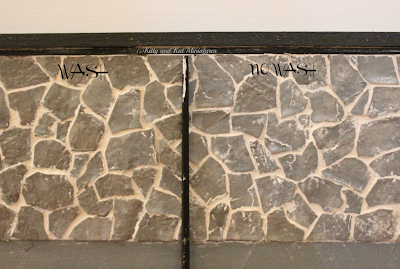 Sometimes the grout sticks no matter what you do and you need to paint over. It also may take a few washes to get the colour you are aiming for. Cinder blocks!!! I made this 1 step on its own. For the "foundation" I made cinder blocks from 60 grit sandpaper. I painted it the medium grey acrylic (any brand will do). I accented with DecoArt black paint (dry brushed on) and then with the Martha Stewart Vanilla Bean wash. I also used the same sealing techniques. 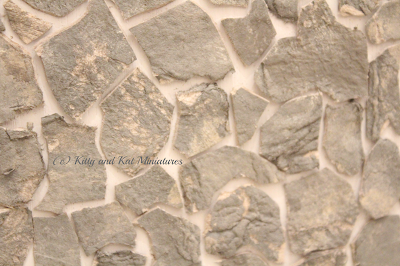 No grout was used. I placed the "blocks" close together and minimized the gap. I was worried that over time the bottom edge of a grout line would chip and break. 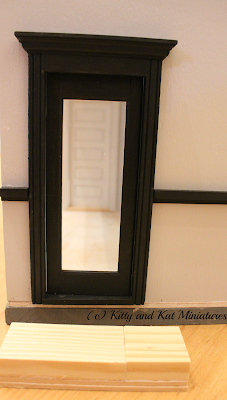 I went to The Little Dollhouse Company today. I behaved myself. Got a few treats. 2 more kits...one is basket weaving and the other, a tray with a tile insert. It's a mini making party at my house right now! Great work - tedious, I'm sure, but it looks fabulous! Everything looks wonderful! I love the color combinations - looks completely real!!! Have fun with the new kits! Can't wait to see! Oh yeah, btw... there is no such thing as lazy when you have a little one at home! Hehe...sometimes the thought of sitting and relaxing is just greater then the thought of mini business. I have improved my photography set up and equipment, so shooting in the basement it is! 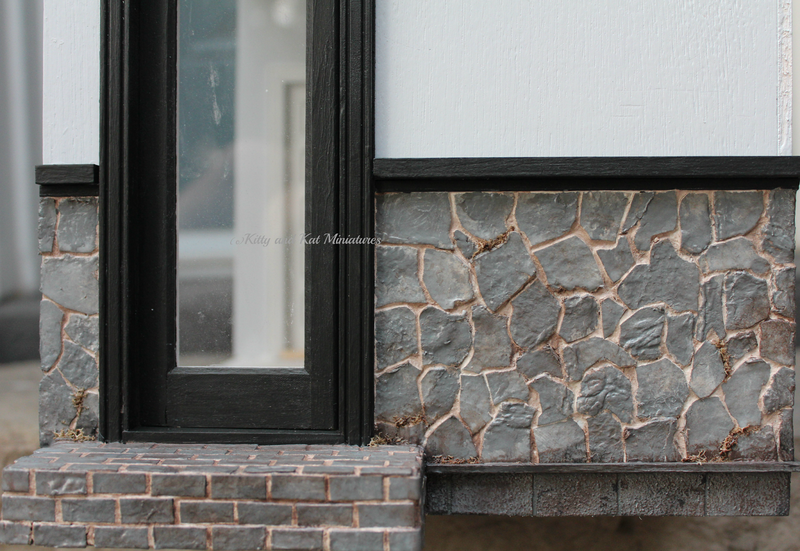 Your stonework, cinderblocks and egg carton Bricks look Wonderful and Very Authentic. You have a way of utilizing and combining materials that I find Fascinating to view. The final effect is Very Convincing as well as Stylish! I'm still hopeful they will put the tutorial back up. Their re-vamped site doesn't have any of their old blog posts, but that might take time. Fingers crossed! And thank you! Thank you for the excellent tutorial. The result looks so real! Happy New Year 2016. You're welcome Sirkka. And happy new year to you too!